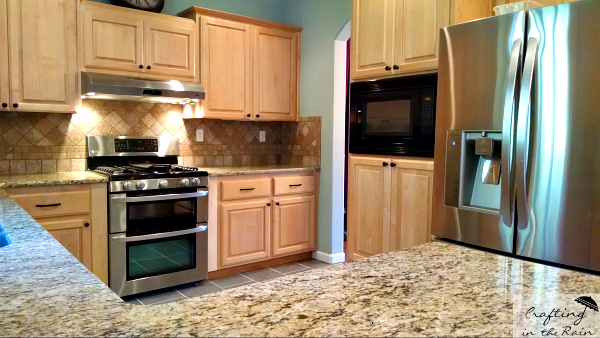 Our kitchen remodel started back at the very end of March. We had a pretty tight timeline, knowing my sister was getting married in June and the whole family would be visiting our house. Nothing like company coming to keep you motivated on a project, right? Here’s one of the listing photos so you can see the original kitchen. It was all the same color and it seemed so boring. Keep reading to see all the after pictures! Get rid of stove top and replace with entire slide in oven/stove and hood vent. So basically, the only thing the same is the actual cabinets. Crazy, right? 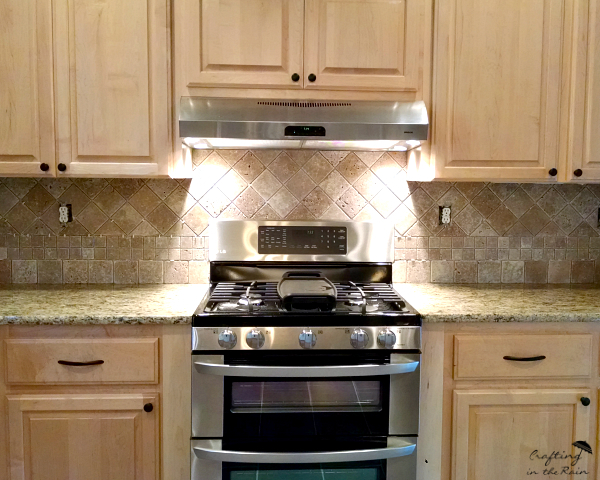 Here’s an up close of the backsplash, new hood and double oven. One of the fanciest parts of our kitchen is the faucet that Moen sent us! We picked the Haysfield in the Spot Resist Stainless finish. I just love the shape of it (and of course the pull down sprayer was a must-have.) Since it has MotionSense, even our youngest can turn on the water to wash his own grapes, for example. Now that’s a bonus! I think it’s great for when I want to rinse off a washcloth, or my own sticky hands. The front sensor just stays on for a few seconds. Then the sensor on top will turn the water on and keep it on until you pass your hand over the sensor. 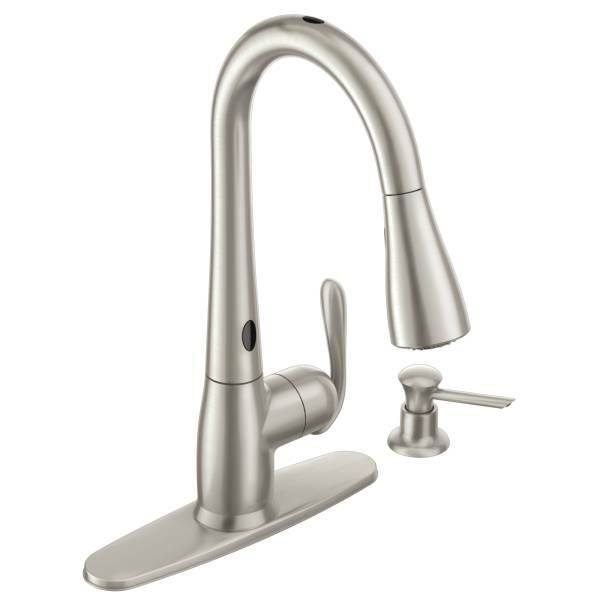 Head over to Moen to see even more design and finish options that will best match your kitchen. 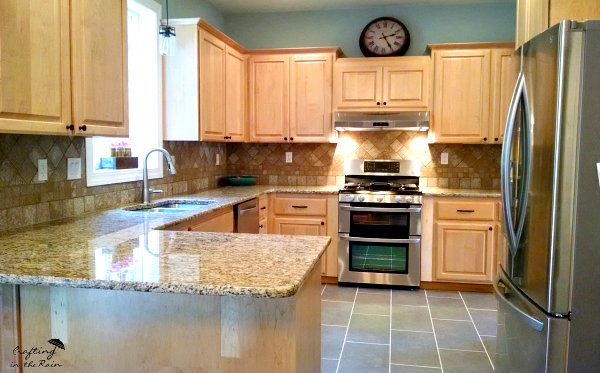 What’s your favorite part of our kitchen remodel? Great job – I love it! We have the same granite & faucet & range hood 🙂 Love the cabinet for the microwave. I'm currently trying to figure out a way to make that happen & clear my counter. We bought this gigantic one & now I'm wishing we didn't as it doesn't fit in the top cabinets & is so big on the counter. Oh – forgot to mention before—–love your floors too. Sooooo pretty! What an amazing transformation!! I love all the colors and details that you added to the kitchen! What is the variety of granite you used? 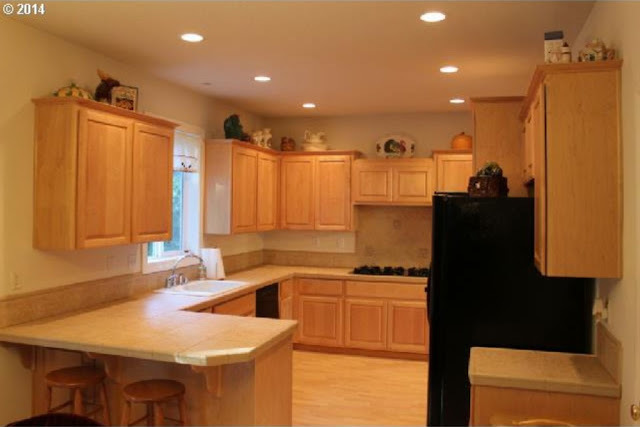 I'm looking for something to go in my kitchen which is very similar in paint color and cabinet color to yours! Thanks!